This 10-year old PVC white single-ply roof system had been severly damaged by hail, resulting in numerous membrane fractures and leak points. A PVC single-ply membrane had been installed over an existing built-up roof on this healthcare facility in Georgia. After only 10 years, hail had fractured the membrane in numerous spots, requiring extensive repairs to prevent leaking. The PVC continued to become brittle and weak. 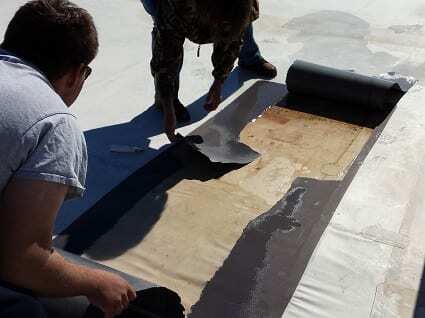 In addition to that, the walk pads welded on top of the membrane had been fractured by hail and turned into water beds. The client sought the contractor for a long-term, sustainable solution for their roof. The roofing contractor laid out the only two options for this particular project. First, the entire roof could be ripped off all the way down to the deck. This would result in massive waste, disruption, and a very high price tag. The other option was to install a liquid-applied membrane directly on top of the existing PVC. Because there were two existing roof systems, another single-ply membrane cannot be installed on top. By choosing a liquid-applied membrane with high durability, strength, and hail resistance, the client could avoid extensive damage and preserve the existing membrane and insulation without tearing it all off and starting with new. The roofing contractor recommended the TRITOflex instant-set rubber membrane due to its 1,900% elongation and FM-approved severe hail resistance and extreme wind uplift ratings. Also, TRITOflex adheres extremely well to existing PVC single-plys even without a primer. With no odor, the roofing installation could be performed while the healthcare facility was still in operation. In order to avoid the high cost, disruption, and inherent issues with the traditional option, the client chose to save with the premium TRITOflex seamless roof system. 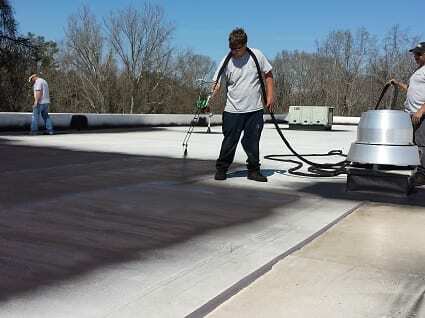 After pressure washing and removing all of the walk pads to ensure no moisture was trapped in the existing system, the TRITOflex two-component rubberized membrane was installed in one coat with a spray application directly over the existing PVC single-ply roof system to achieve a 60 mil/1.5mm seamless membrane. It was then top coated with two coats of TRITOtherm thermal insulating coating at 20 mils/0.5mm to provide superior energy cost savings in the hot summers and protect the membrane as a sacrificial layer for decades. With an industry-leading FM-approved hail resistance classification and leading puncture resistance properties, the flexible TRITOflex membrane will protect this building from anything the elements or roof-top HVAC workers may bring at it in the future. The TRITOflex recover system being environmentally safe with no VOC’s, and no harmful or disruptive odors, proved to be the most cost-effective and prudent solution for the healthcare facility. This healthcare facility can rest assured they will have no disruptions to their operations due to a leaking roof and they now have an energy-saving, hail-resistant roof system.